What else happened in the world that year? Today’s luxury car maker, the German BMW company was established in March 1916 as the Die Bayerische Motoren Werke and the plane maker, the American Boeing company was established in July 1916 as the then Pacific Aero Products. 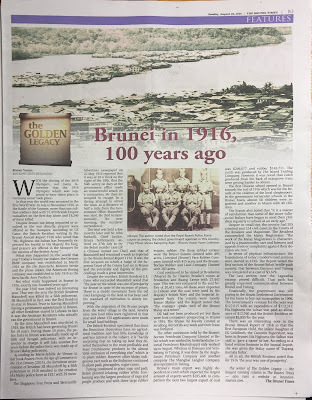 But what really happened in Brunei in 1916, exactly one hundred years ago? 1916 was indeed an interesting year. That was the year the British Resident Maundrell was killed by a Sikh policeman. E.B. Maundrell in fact, was the first Resident to stay in Brunei. Prior to having Maundrell having a permanent appointment in Brunei, all other Residents stayed in Labuan. In fact it was the Assistant Residents who actually ran the government in Brunei. The Singapore Free Press and Mercantile Advertiser newspaper on 22 May 1916 reported that it was at 10 o’clock on the night of the 18th, that the Sikh sentry on duty at the government office made an unsuccessful attack on a companion. He then attempted to escape. In a daring attempt to arrest the man, at a distance of half a mile from the Government Office, Maundrell was shot. He died instantaneously. The next morning, the murderer surrendered. The trial was held a few months later and His Honour Sir John Bucknill, Chief Justice, Straits Settlements, arrived on 27th July to try the Belait murder case (of a Chinese named Joo Chai) and that of Mr Maundrell and remained a week as reported in the Brunei Annual Report 1916. It was the first occasion on which a Judge of the Supreme Court of the Colony had sat in Brunei and the solemnity and dignity of the proceedings made a great impression. 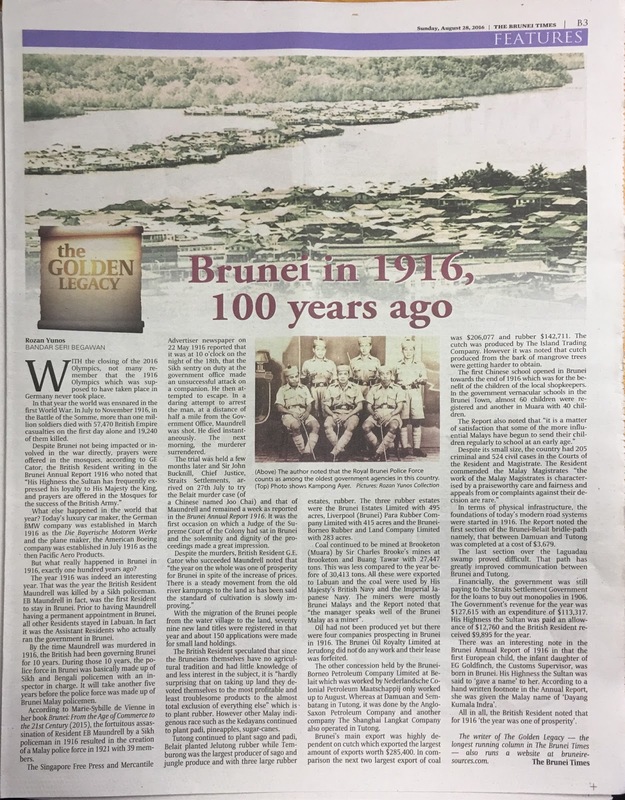 With the migration of the Brunei people from the water village to the land, seventy nine new land titles were registered in that year and about 150 applications were made for small land holdings. The British Resident speculated that since the Bruneis themselves have no agricultural tradition and had little knowledge of and less interest in the subject, it is “hardly surprising that on taking up land they devoted themselves to the most profitable and least troublesome products to the almost total exclusion of everything else” which is to plant rubber. However other Malay indigenous race ssuch as the Kedayans continued to plant padi, pineapples, sugar-canes. Tutong continued to plant sago and padi, Belait planted Jelutong rubber while Temburong was the largest producer of sago and jungle produce and with three large rubber estates, rubber. The three rubber estates were the Brunei Estates Limited with 495 acres, Liverpool (Brunei) Para Rubber Company Limited with 415 acres and the Brunei-Borneo Rubber and Land Company Limited with 283 acres. Oil had not been produced yet but there were four companies prospecting in Brunei in 1916. The Brunei Oil Royalty Limited at Jerudong did not do any work and their lease was forfeited. The other concession held by the Brunei-Borneo Petroleum Company Limited at Belait which was worked by Nederlandsche Colonial Petroleum Maatschappij only worked up to August. Whereas at Damuan and Sembatang in Tutong, it was done by the Anglo-Saxon Petroleum Company and another company The Shanghai Langkat Company also operated in Tutong. Brunei’s main export was highly dependent on cutch which exported the largest amount of exports worth $285,400. In comparison the next two largest export of coal was $206,077 and rubber $142,711. The cutch was produced by The Island Trading Company. However it was noted that cutch produced from the bark of mangrove trees were getting harder to obtain. In terms of physical infrastructure, the foundations of today’s modern road systems were started in 1916. The Report noted the first section of the Brunei-Belait bridle-path namely, that between Damuan and Tutong was completed at a cost of $3,679. The last section over the Laguadau swamp proved difficult. That path has greatly improved communication between Brunei and Tutong. Financially, the government was still paying to the Straits Settlement Government for the loans to buy out monopolies in 1906. The Government’s revenue for the year was $127,615 with an expenditure of $113,317. His Highness the Sultan was paid an allowance of $12,760 and the British Resident received $9,895 for the year. There was an interesting note in the Brunei Annual Report of 1916 in that the first European child, the infant daughter of Mr. EG Goldfinch, the Customs Supervisor, was born in Brunei. His Highness the Sultan was said to ‘gave a name’ to her. According to a hand written footnote in the Annual Report, she was given the Malay name of ‘Dayang Kumala Indra’.